1.1 Earth scientists find solutions to society’s needs. Earth scientists work on challenging problems that face humanity on topics such as climate change and human impacts on Earth. Earth scientists successfully predict hazards to humans and locate and recover natural resources, making possible the flourishing of humans on Earth. 1.2 Earth scientists use a large variety of scientific principles to understand how our planet works. 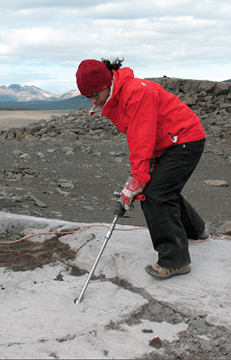 Earth scientists combine study of Earth’s geology with aspects of biology, chemistry, physics, and mathematics in order to understand the complexities of the Earth system. 1.3 Earth science investigations take many different forms. Earth scientists do reproducible experiments and collect multiple lines of evidence. This evidence is taken from field, analytical, theoretical, experimental, and modeling studies. 1.4 Earth scientists must use indirect methods to examine and understand the structure, composition, and dynamics of Earth’s interior. With the exception of wells and mine shafts drilled into Earth, direct observations of Earth’s interior are not possible. Instead, Earth scientists observe the interior of the planet using seismic waves, gravity, magnetic fields, radar, sonar, and laboratory experiments on the behavior of materials at high pressures and temperatures. 1.5 Earth scientists use their understanding of the past to forecast Earth’s future. Earth science research tells us how Earth functioned in the past under conditions not seen today and how conditions are likely to change in the future. 1.6 Earth scientists construct models of Earth and its processes that best explain the available geological evidence. These scientific models, which can be conceptual or analytical, undergo rigorous scrutiny and testing by collaborating and competing groups of scientists around the world. Earth science research documents are subjected to rigorous peer review before they are published in science journals. 1.7 Technological advances, breakthroughs in interpretation, and new observations continuously refine our understanding of Earth. This Earth Science Literacy framework must be a living document that grows along with our changing ideas and concepts of Earth.